miR-25, PTEN, PI3K/AKT, FoxO3a, p27Kip1, SKOV3, Ovarian cancer. Ovarian Cancer (OC) is one of the common malignant tumours occurred in female genital organs, and its incidence rate is only second to cervical cancer and uterine body carcinoma, ranking the third among malignant tumours of female genital system . Epithelial Ovarian Cancer (EOC) is one of the most common cancers in all ovarian cancers, approximately accounting for 80%~90% of all ovarian cancer pathological types . Phosphatidyl inositol 3-kinase/protein kinase B (PI3K/AKT) is an important signal transduction pathway that participates in the regulation of cell survival, which could antagonize cell apoptosis, promote cell proliferation and survival, etc. Its abnormal expression and excessive activation are correlated with tumorigenesis, tumor progression and drug resistance, etc. . Phosphatase and tensin homology deleted on chromosome ten (PTEN), firstly discovered in 1997, is the only cancer suppressor gene both has the lipoprotein lipase and phosphatase activities synchronously to date, and it can play regulation roles on cell proliferation, apoptosis, migration and differentiation and other various biological processes via the negative regulation on the PI3K/AKT signal pathway, which can play roles on in promoting the cell proliferation and cell survival . Decreased expression of PTEN or function defect and excessive activation of PI3K/AKT signal pathway are correlated with multiple tumors, such as, lung cancer , Esophageal cancer , Breast cancer , Colorectal cancer and so on . Studies indicated that the expression of PTEN in tumour tissues was significantly decreased in patients with the ovarian cancer, suggesting that PTEN acts as the cancer suppressor gene in the onset of ovarian cancer . Being a single-stranded non-coding micro molecular RNA that is endogenously expressed by organisms in the length of approximately 22~25 nucleotides, microRNA inhibits the translation of mRNA or degrades mRNA via complete or incomplete complementary pairing with 3'-untranslated region (3'-UTR) of the target gene mRNA, so that the expression of genes could be negatively regulated at the level of post transcription . A number of studies have reported that [11-13] the expression of miR-25 in tumour tissues or ovarian cancer cell lines was significantly increased in patients with the ovarian cancer, indicating that the increased expression of miR-25 may act as the carcinogenic gene in the onset of the ovarian cancer. Bioinformatics analysis shows that there are complementary pairing binding sites between miR-25 and 3'- UTR of PTEN mRNA. This study aims to investigate whether miR-25 plays roles in regulating the expression of PTEN and affecting the proliferation and apoptosis of cell line SKOV3 of epithelial ovarian cancer. Human cell line SKOV3 of epithelial ovarian cancer was purchased from the cell bank of Chinese Academy of Sciences; RPMI 1640 medium, FBS and mycillin were purchased from Gibco, U.S.A; Liposome transfection reagent Lipofectamine 2000 was purchased from Invitrogen, U.S.A.; ReverTra Ace qPCR RT Kit and SYBR dye were purchased from Toyobo, Japan; Mouse anti-PTEN, rabbit anti-p-FoxO3a were purchased from Abcam, U.S.A.; Mouse anti- p-AKT was purchased from CST, U.S.A.; Mouse anti-p27Kip1 was purchased from Santa cruz, U.S.A.; HRP labeled Goat-antirabbit and rabbit-anti-mouse secondary antibodies were purchased from Jackson ImmunoResearch, U.S.A. NaN3 was purchased from Guoao Biology, Guangzhou, China; Annexin V/PI apoptosis detection reagents were purchased from YEASEN Biology, Shanghai, China; Dual-Luciferase® Reporter Assay System and pGL3-promoter plasmid were purchased from Promega, U.S.A.
Sixty-eight patients with the epithelial ovarian cancer were enrolled into this study, who were initially diagnosed and received treatment in the hospital from January 2015 to March 2016, and the tumor samples removed during the surgery were preserved. The patients were aged from 29 to 69 y old with the mean age of 52.5 y old. All the cases were confirmed through the pathological examination, including 45 patients with serous cystadenocarcinoma and 23 patients with mucinous cystadenocarcinoma. The pathological staging conformed to the criteria for ovarian cancer specified by the International Federation of Gynecology and Obstetrics (FIGO) : 8 patients were at the stage I, 14 patients were at the stage II, 21 patients were at the stage III, 15 patients were at the stage IV. Thirty cases of normal ovarian tissues incised during the surgery for patients with uterine fibroid were used as the control. All these patients were aged from 1 to 70 y old with the mean age of 53.9 y old. All patients provided a signed informed consent, and the protocols were approved by the Ethics Committee of the hospital. SKOV3 cells were inoculated on RPMI 1640 medium containing 10% FBS and 1% mycillin, and maintained in a 5% CO2 incubator at 37°C, and the medium was replaced every 2~3 d. Cells at logarithmic phase with good state were selected for experiments. DNA of HEK293 cells was used as the template to amplify the total length of 3'-UTR segment of PTEN gene. PCR products were recycled by gel extraction kit and then were connected to pGL-3M vector following the digestion. DH5α competent bacteria were transformed, and the positive clones were screened by PCR of bacterial colonies. Then, the plasmids with correct sequencing were used for subsequent experiments. 400 ng pGL3-PTEN-3'UTR, 20 nmol miR-25 mimic (or mimic NC) and 10 ng pRL-TK were co-transfected into HEK293 cells by Lipofectamine 2000, and the activity of luciferase was detected after 48 h. The brief procedures for the detection on the activity of dual-luciferase are as follows: HEK293 cells were rinsed by PBS twice, and 100 μL PLB was added and shaken for 20~30 min, and then centrifuged at 1000 rpm for 15 min. The supernatant was preserved. The fluorescence value I was measured by ELIASA immediately after twenty μL of supernatant was mixed with 100 μL LAR II, and then the fluorescence value II was measured immediately after the reactions were terminated by adding 100 μL Stop and Glo. The ratio of the fluorescence value I and fluorescence value II was the relative activity of luciferase. pIRES2 was used as the plasmid of eukaryotic expression, and Xho I and BamH I were selected as the restriction enzymes. cDNA was used as the template to amplify PTEN gene. Gel extraction kit was used to collect target fragments separated by gel electrophoresis, and then the fragments were connected to the vector and the products were transferred into the competent cell JM109. Ammonia benzyl resistant solid culture plate was used to screen the positive strains, then the positive strains were amplifying cultured, and the recombinant plasmids with target segments were extracted. Then, the correct insertion of target segments of PTEN gene was determined by sequencing. Plasmids of inhibitor NC and miR-25 inhibitor, pIRES2- Scramble control plasmid with disordered sequence or overexpression plasmid pIRES2-PTEN were transfected into SKOV3 cells by Lipofectamine 2000, and they were divided into five groups: Inhibitor NC group, miR-25 inhibitor group, pIRES2-Scramble group, pIRES2-PTEN group and miR-25 inhibitor+pIRES2-PTEN group. Cells were collected for detection after transfection for 72 h.
miR-25PF: 5'-CGGCGGCATTGCACTTGGTCTC-3', miR-25PR: 5'-GTGCAGGGTCCGAGGT-3'; U6PF: 5'- ATTGGAACGATACAGAGAAGATT-3', U6PR: 5'- GGAACGCTTCACGAATTTG-3'; PTENPF: 5'- CTGGTCTGCCAGCTAAAGGT-3', PTENPR: 5'- TCACCACACACAGGTAACGG-3'; p27Kip1PF: 5'- ATCACAAACCCCTAGAGGGCA-3', p27Kip1PR: 5'- GGGTCTGTAGTAGAACTCGGG-3'; β-actinPF: 5'- GAACCCTAAGGCCAAC-3', β-actinPR: 5'- TGTCACGCACGATTTCC-3'. In the PCR reaction system with the total volume of 10 μL, 5.0 μL of 2X SYBR Green Mixture, 0.5 μL of 2.5 μm/L forward and reverse primers separately, 1.0 μL of cDNA and 3.0 μL of ddH2O were added. Conditions for PCR: 95°C for 5 min, 95°C for 15 s, 60°C for 60 s. Forty cycles were amplified by the Bio- Rad CFX96 fluorescence quantitative PCR instrument, and fluorescent data were collected and analysed. NP40 filtered cells were used and the supernatant was collected to measure the concentration of proteins. 6 μg of supernatant was sampled and separated by 10% SDS-PAGE for 2.5 h; the product was transferred into the PVDF film for 1.5 h, and blocked by 5% skim milk powder for 60 min at room temperature. The primary antibodies were inoculated at 4°C overnight (The dilution ratio of PTEN, p-AKT, p-FoxO3a, p27Kip1 and β-actin was 1: 200, 1: 100, 1: 100, and 1: 200, 1: 1000, respectively), and then rinsed by PBST for three times. The HRP labeled secondary antibodies were incubated for 60 min at room temperature, and rinsed by PBST for three times, and then incubated at room temperature for 2 min after ECL chemiluminescence liquid was added. Subsequently, the above solution was exposed, developed and fixed in a dark room, and the data obtained were analysed following scanning. Cells were centrifuged and collected, and then rinsed by PBS twice. Next, 100 μL of Binding Buffer was added, blown and mixed, and then 5 μL of Annexin V-FITC and 5 μL of PI were added and reacted for 10 min in dark. Subsequently, 400 μL of Binding Buffer was added and the cells were re-suspended. Beckman FC 500MCL flow cytometer was used for detection. Cells were digested by pancreatin, and rinsed with PBS for twice, and then, the cells were fixed by 75% alcohol at 4°C overnight, and then rinsed with PBS for twice. Subsequently, cells were stained by the dye solution containing 20 μg/ml of RNase A, 0.1% Triton X-100 and 100 μg/ml PI at 4°C in dark for 20 min, and then the cells were tested by the flow cytometer immediately. Statistical analysis of data was performed by SPSS 18.0. Measurement data were expressed by mean ± standard deviation. The student t test was used in the comparison of inter-group measurement data, and P<0.05 indicated that the difference was statistically significant. The results of qRT-PCR showed that the expression level of PTEN mRNA in tumour tissues in patients with EOC was significantly lower than that of normal ovarian tissues (Figure 1A), while the expression level of miR-25 was obviously higher than the latter (Figure 1B), and all these were correlated with the pathological staging of FIGO. The results of Western blot assay indicated that compared to normal ovarian tissues, the expression of PTEN proteins was significantly decreased in tumour tissues for patients with EOC (Figure 1C), and the more advanced pathological staging of FIGO was, the more decreased expression level was. The results suggested that the abnormal overexpression of miR-25 may decrease the expression of PTEN and promote the occurrence of EOC. Figure 1: Disordered expression of miR-25 and PTEN in EOC tissues. 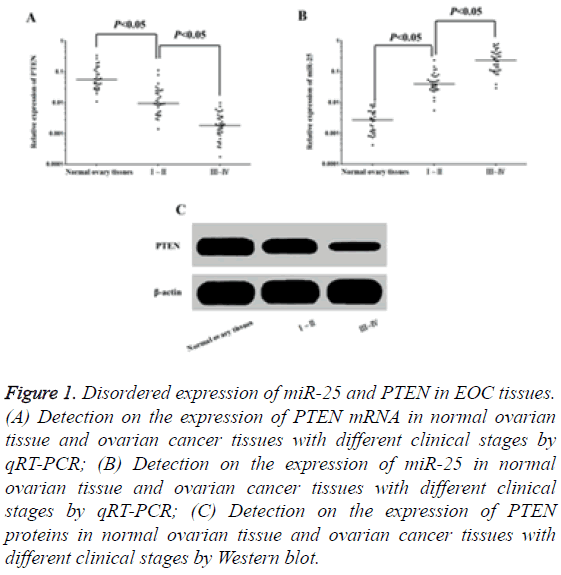 (A) Detection on the expression of PTEN mRNA in normal ovarian tissue and ovarian cancer tissues with different clinical stages by qRT-PCR; (B) Detection on the expression of miR-25 in normal ovarian tissue and ovarian cancer tissues with different clinical stages by qRT-PCR; (C) Detection on the expression of PTEN proteins in normal ovarian tissue and ovarian cancer tissues with different clinical stages by Western blot. The target gene prediction results from microRNA, org online showed that there were targeted complementary pairing binding sites between miR-25 and 3'-UTR of PTEN mRNA (Figure 2A). The results of dual-luciferase reporter gene experiments indicated that the transfection of miR-25mimic significantly decreased the relative activity of the luciferase in HEK293 cells (Figure 2B) and the expression of PTEN in SKOV3 cells (Figures 2C and 2D). However, the transfection of mimic NC had no significant inhibition on the relative activity of luciferase in HEK293 cells and the expression of PTEN in SKOV3 cells, suggesting that miR-25 could targeting inhibit the expression of PTEN. Figure 2: Targeting inhibition on the expression of PTEN by miR-25. (A) T-Schematic diagram of the binding site between miR-25 and PTEN 3'-UTR in the prediction of microRNA.org target gene mRNA; (B) Detection of relative luciferase activity in HEK293 cells transfected with mimic NC and miR-25 mimic by dual luciferase reporter gene experiments; (C) Detection on the expression of miR-25 and PTEN in SKOV3 cells transfected with mimic NC and miR-25 mimic by qRT-PCR; (D) Detection on the expression of PTEN proteins in SKOV3 cells transfected with mimic NC and miR-25 mimic by Western blot assay. Down-regulation on the expression of miR-25 and (or) upregulation on the expression of PTEN can significantly inhibit the expression of p-AKT (Figures 3A and 3B) and obviously reduce the phosphorylation of FoxO3a (Figure 3B). Moreover, the expression of p27Kip1 was significantly enhanced (Figure 3B) and the cell apoptosis (Figure 3C) was significantly increased, and cell cycles were blocked at the stage G0/G1 (Figure 3D). Figure 3: Down-regulation on the expression of miR-25 can inhibit the proliferation of SKOV3 cells and promote their apoptosis. 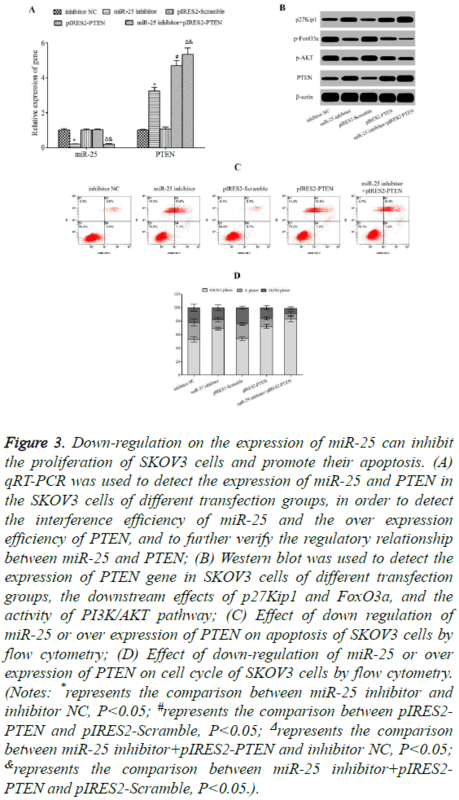 (A) qRT-PCR was used to detect the expression of miR-25 and PTEN in the SKOV3 cells of different transfection groups, in order to detect the interference efficiency of miR-25 and the over expression efficiency of PTEN, and to further verify the regulatory relationship between miR-25 and PTEN; (B) Western blot was used to detect the expression of PTEN gene in SKOV3 cells of different transfection groups, the downstream effects of p27Kip1 and FoxO3a, and the activity of PI3K/AKT pathway; (C) Effect of down regulation of miR-25 or over expression of PTEN on apoptosis of SKOV3 cells by flow cytometry; (D) Effect of down-regulation of miR-25 or over expression of PTEN on cell cycle of SKOV3 cells by flow cytometry. (Notes: *represents the comparison between miR-25 inhibitor and inhibitor NC, P<0.05; #represents the comparison between pIRES2- PTEN and pIRES2-Scramble, P<0.05; Δrepresents the comparison between miR-25 inhibitor+pIRES2-PTEN and inhibitor NC, P<0.05; &represents the comparison between miR-25 inhibitor+pIRES2- PTEN and pIRES2-Scramble, P<0.05.). It is estimated that 225,000 patients are newly diagnosed with ovarian cancer every year throughout the world , and patients who die of ovarian cancer reach up to 145,000 every year . There are significant differences in the regional distribution for ovarian cancer. The incidence rate in western developed countries is higher (approximately 10~12/100,000) than that in China (about 2~3/100,000). However, the incidence rate of ovarian cancer in China has been increasing year by year recently [15,17]. According to statistics , the mortality rate of ovarian rate reaches up to 5~7/100,000 throughout the world and ranks the first among malignant tumours of female reproductive system, which seriously endangers the life and health of females. The development of ovarian cancer is relatively hidden, and no significantly clinical symptoms were found at the early stage. However, this disease is progressed quickly, and approximately 60%~70% of patients have been in the middle and advanced stage when they feel discomfort and seek for medical treatment . To date, no satisfactory clinical effects are obtained in the dominated surgical excision treatment, supplemented by chemotherapy and radiotherapy measures, and the qualities of lives of patients are not significantly improved. The 5 y survival rate is still lower being about 20~30% . In general, the recurrence rate of ovarian cancer is higher for its characteristics of easy to metastasis and acquiring drug resistance, and approximately 50%~70% of patients will suffer from re-occurrence within 18 months after the first-line treatment . Nearly all the development processes of tumours involve the changes of multiple factors and pathways of overexpression of proto oncogenes, viability and function defects of cancer suppressor genes, and PI3K/AKT signal transduction pathway extensively participates in the regulation of cell proliferation, cycle, apoptosis, differentiation and other biological effects, and is closely correlated with the occurrence, progression, treatment and outcome of malignant tumours . PI3K, an important member in phospholipids kinase family, is formed by the third inositol phosphorylation of the phosphoinositide ring on the cell membrane and consists of catalytic subunit P110 and regulatory subunit P85. Under the stimulation of extracellular signals, PI3K is recruited into the site adjacent to the plasma membrane to catalyse the phosphorylation of its substrate phosphatidylinositol 4, 5-trisphosphate (PIP2) to generate phosphatidylinositol 3, 4, 5-trisphosphate (PIP3) . AKT, also named protein kinase B (PKB), is a specific protein kinase to serine/threonine, and is one of downstream target molecules of PI3K. AKT under the rest state is usually distributed in the cytoplasm, however, under the action of the second messenger PIP3, the lipid binding site of AKT (i.e., PH binding site) can specifically combine with PIP3, which induces the conformational changes in the tertiary structure of AKT, as a result, it transfers from the cytoplasm to the cell membrane, and the two main phosphorylated residues of AKT are exposed. Under the catalytic action of PI3K-dependent kinase 1 (PDK1) and PI3K-dependent kinase 1 (PDK2), Thr308 and Ser473 sites of AKT are phosphorylated, and the phosphorylated and activated AKT can continuously deliver the information of promoting the cell growth and proliferation and inhibiting the cell apoptosis to downstream . FoxO3a, an important member in Fork Head Transcription Factor (FKHR) family, can up regulate the expression of proapoptosis genes, for example, specific Cyclin-dependent Kinase Inhibitor (CKI) p27Kip1 , Bim , PUMA , or down-regulate the expression of antiapoptotic gene FLIP , and play roles on promoting cell apoptosis. Cell cycle regulatory protein p27Kip1 can closely combine with CDK2 and CDK4, inhibit their activities and block cells from entering into DNA synthetic stage S, thus blocking cell cycles at the stage G0/G1 and negatively regulating the proliferation of cells . Phosphorylated and activated AKT in PI3K/AKT signal pathway can further phosphorylate FoxO3a to transfer FoxO3a from the nucleus to cytoplasm and reduce its transcriptional regulation on the nuclear genes , while the dephosphorylated FoxO3a immediately enters into the nucleus from the cytoplasm to trigger the transcription and translation of target genes and accelerate the cell apoptosis . As a cancer suppressor gene, PTEN can inhibit the activity of phosphatase through dephosphorylation of PIP3 , or directly removing the phosphate group on serine/threonine residues of AKT, so as to antagonize the regulation of PI3K/AKT signal pathway on cell proliferation, cycle and apoptosis . Studies indicated  that the expression of PTEN in tumour tissues was significantly decreased for patients with the ovarian cancer, suggesting that PTEN can act as a cancer suppressor gene in the onset of ovarian cancer. A number of studies reported that [11-13] the expression of miR-25 in tumour tissues or ovarian carcinoma cells were significantly increased in patients with the ovarian cancer, indicating that the increased expression of miR-25 may act as the carcinogenic gene in the onset of the ovarian cancer. Bioinformatics analysis shows that there are complementary pairing binding sites between miR-26a and 3'-UTR of PTEN mRNA. This study aims to investigate whether miR-25 plays roles on regulating the expression of PTEN and affecting the proliferation and apoptosis of cell lines SKOV3 of the epithelial ovarian cancer. The results of this study indicated that compared to normal ovarian tissues, the expression of PTEN in epithelial ovarian cancer tissues was significantly decreased, and the expression of miR-25 was significantly increased. With the increasing of pathological staging of FIGO, the expression level of PTEN was gradually decreased, while the expression of miR-25 was increased, suggesting that the high expression of miR-25 may play roles in down regulating the expression of PTEN and promoting the onset of EOC. The studies performed by Yang et al. showed that the expression level of PTEN was significantly decreased in tumour tissues for patients with ovarian cancer. The studies performed by Schondorf et al. showed that the expression of PTEN was abnormally reduced in tumour tissues for patients with the ovarian cancer, furthermore, the more decreased the expression level was, the worse the prognosis was and the patients' conditions were more prone to progressed or aggravated. The studies performed by Chen et al. indicated that the detection rate of the 5th exon gene mutation was higher on the PTEN gene for patients with EOC, so that the expression level of PTEN mRNA in tumour tissues was significantly lower than that of normal ovarian tissues or ovarian cyst tissues. The present study found that the expression level of PTEN was abnormally decreased in cancer tissues of patients with ovarian cancer, which is basically consistent with the results of the above studies. This indicates that the reduction of PTEN expression was involved in the onset of ovarian cancer. The studies performed by Wang et al. demonstrated that the expression level of miR-25 in tumour tissues of patients with EOC was significantly higher than that of para-carcinoma tissues, and its expression level was significantly correlated with the pathological staging and pathological differentiation; The six-year survival rate of patients with higher expression of miR-25 was only 15.96%, significantly lower than patients with lower expression of miR-25 being 45.89%. The studies performed by Feng et al. showed that the expression level of miR-25 was abnormally increased in tumour tissues and cancer cell lines of ovarian tissues. The studies performed by Zhang et al. also found that the expression of miR-25 in tumour tissues for patients with ovarian cancer was higher than that of normal ovarian tissues, and the expression level of miR-25 in ovarian cancer cell lines SKOV3, OVCAR3, OVCAR5 and A2780 was obviously higher than that of Ovarian Surface Epithelial cells (OSE). The results of this study showed that the expression level of miR-25 in cancer tissues for patients with EOC was obviously higher than that of normal ovarian tissues, which was consistent with the results of Feng et al. and Zhang et al. . The results of dual-luciferase reporter gene experiments showed that the transfection of miR-25 mimic could significantly reduce the relative activity of luciferase in HEK293 cells and the expression of PTEN in SKOV3 cells, proving that there were targeted regulatory relations between miR-25 and PTEN. Further detection showed that the downregulation on the expression of miR-25 and (or) up-regulation on the expression of PTEN can significantly inhibit the expression of p-AKT, and significantly decrease the phosphorylation of FoxO3a and increase the expression of p27Kip1. Moreover, the cell apoptosis was significantly increased, and the cell cycle was blocked at the stage G0/G1. The studies performed by Zhang et al. indicated that the down-regulation on the expression of miR-25 can significantly induce the apoptosis of ovarian cells SKOV3 and OVCAR3, and the overexpression of miR-25 can obviously promote the proliferation of SKOV3 and OVCAR3. Both the stimulated proliferation and antiapoptotic effects of miR-25 on ovarian cancer cells would be realized through the targeted inhibition on the expression of cancer suppressor gene BIM. The studies performed by Feng et al. , indicated that miR-25 can promote the proliferation, migration and invasion and other biological functions of ovarian cancer cells through the targeting inhibition on the expression of Large Tumour Suppressor 2 (LATS2), so as to act as the carcinogenic gene in the onset of ovarian cancer. This study observed that miR-25 could inhibit the apoptosis of ovarian cancer cells SKOV3 and promote cell cycles, suggesting that the increased expression of miR-25 was correlated with the development of ovarian cancer and malignant biological characteristics of cells, which was basically consistent with the results of Feng et al. and Zhang et al. . The study results of Feng et al. indicated that the decreased expression of the pro-apoptosis gene FoxO3a was significantly correlated with the poor prognosis of patients with ovarian cancer. The study results of Lu et al. indicated that the expression of FoxO3a was significantly decreased in tumour tissues for patients with ovarian cancer. Lu et al. also  revealed that the significantly increased phosphorylation of FoxO3a in ovarian cancer tissues was positively correlated with significantly increased expression of Ki-67. These studies indicated that the disordered expression of FoxO3a as an important regulatory factor played roles in the onset of ovarian cancer. This study indicated that, through the targeting inhibition on PTEN, the abnormally increased expression of miR-25 could , up-regulate the activity of PI3K/AKT signal pathway, increase the phosphorylation activity of FoxO3a and down-regulate the expression of p27Kip1, and consequently to antagonize the cell apoptosis of ovarian cancer cell SKOV3 and promote the progress of cell cycles. These may play roles in the onset of ovarian cancer. The expression of miR-25 was significantly increased and the expression of PTEN was significantly decreased in ovarian tumour tissues. Through the targeting inhibition on PTEN, the abnormally increased expression of miR-25 could up-regulate the activity of PI3K/AKT signal pathway, increase the phosphorylation activity of FoxO3a and down-regulate the expression of p27Kip1, and consequently to antagonize the cell apoptosis of ovarian cancer cell SKOV3 and promote the progress of cell cycles. These may play roles in the onset of ovarian cancer. Giornelli GH. Management of relapsed ovarian cancer: a review. Springer Plus 2016; 5: 1197. Jammal MP, Martins-Filho A, Silveira TP, Murta EFC, Nomelini RS. Cytokines and prognostic factors in epithelial ovarian cancer. Clin Med Insights Oncol 2016; 10: 71-76. Martini M, De Santis MC, Braccini L, Gulluni F, Hirsch E. PI3K/AKT signaling pathway and cancer: an updated review. Ann Med 2014; 46: 372-383. Mccabe N, Kennedy RD, Prise KM. The role of PTFE as a cancer biomarker. Onecoscience 2016; 3: 54-55. Perez-Ramirez C, Canadas-Garre M, Molina MA, Faus-Dader MJ, Callja-Hernandez MA. PTEN and PI3K/AKT in non-small-cell lung cancer. Pharmacogenomics 2015; 16: 1843-1862. Wu YR, Qi HJ, Deng DF, Luo YY, Yang SL. MicroRNA-21 promotes cell proliferation, migration, and resistance to apoptosis through PTEN/PI3K/AKT signaling pathway in esophageal cancer. Tumour Biol 2016. Wang F, Li L, Chen Z, Zhu M, Gu Y. MicroRNA-214 acts as a potential oncogene in breast cancer by targeting the PTEN-PI3K/Akt signalling pathway. Int J Mol Med 2016; 37: 1421-1428. Zheng L, Zhang YQ, Liu Y, Zhou M, Lu YX, Yuan L. MiR-106b induces cell radioresistance via the PTEN/PI3K/AKT pathways and p21 in colorectal cancer. J Transl Med 2015; 13: 252. Cai J, Xu L, Tang H, Yang Q, Yi X, Fang Y. The role of the PTEN/PI3K/Akt pathway on prognosis in epithelial ovarian cancer: a meta-analysis. Oncologist 2014; 19: 528-535. Liang T, Guo Q, Li L, Cheng Y, Ren C, Zhang G. MicroRNA-433 inhibits migration and invasion of ovarian cancer cells via targeting Notch1. Neoplasma 2016; 63: 696-704. Feng S, Pan W, Jin Y, Zheng J. MiR-25 promotes ovarian cancer proliferation and motility by targeting LATS2. Tumour Biol 2014; 35: 12339-12344. Zhang H, Zuo Z, Lu X, Wang H, Zhu Z. MiR-25 regulates apoptosis by targeting Bim in human ovarian cancer. Oncol Rep 2012; 27: 594-598. Wang X, Meng X, Li H, Liu W, Shen S, Gao Z. MicroRNA-25 expression level is an independent prognostic factor in epithelial ovarian cancer. Clin Transl Oncol 2014; 16: 954-958. Javadi S, Ganeshan DM, Qayyum A, Lyer RB, Bhosale P. Ovarian cancer, the revised FIGO staging system, and the role of imaging. AJR Am J Roentgenol 2016; 206: 1351-1360. La Vecchia C. Ovarian cancer: epidemiology and risk factors. Eur J Cancer Prev 2016. Hunn J, Rodriguez GC. Ovarian cancer: etiology, risk factors, and epidemiology. Clin Obstet Gynecol 2012; 55: 3-23. Ferlay J, Soerjomataram I, Dikshit R, Eser S, Mathers C, Rebelo M. Cancer incidence and mortality worldwide: sources, methods and major patterns in GLOBOCAN 2012. Int J Cancer 2015; 136: 359-386. Siegel R, Ma J, Zou Z, Ahmedin J. Cancer statistics, 2014. CA Cancer J Clin 2014; 64: 9-29. Colvin EK. Tumor-associated macrophages contribute to tumor progression in ovarian cancer. Front Oncol 2014; 4: 137. Siegel R, Desantis C, Virgo K, Stein K, Mariotto A, Smith T. Cancer treatment and survivorship statistics, 2012. CA Cancer J Clin 2012; 62: 220-241. Zhao H, Guo E, Hu T, Sun Q, Wu J, Lin X. KCNN4 and S100A14 act as predictors of recurrence in optimally debulked patients with serous ovarian cancer. Oncotarget 2016. Zhou H, Wu J, Wang T, Zhang X, Liu D. CXCL10/CXCR3 axis promotes the invasion of gastric cancer via PI3K/AKT pathway-dependent MMPs production. Biomed Pharmacother 2016; 82: 479-488. Jin Y, Huang M, Wang Y, Yi C, Deng Y, Jiang L. c-Yes enhances tumor migration and invasion via PI3K/AKT pathway in epithelial ovarian cancer. Exp Mol Pathol 2016; 101: 50-57. Chen Y, Jiang J, Zhao M, Luo X, Liang Z, Zhen Y. microRNA-374a suppresses colon cancer progression by directly reducing CCND1 to inactivate the PI3K/AKT pathway. Oncotarget 2016. Nakao T, Geddis AE, Fox NE, Kaushansky K. PI3K/Akt/FOXO3a pathway contributes to thrombopoietin-induced proliferation of primary megakaryocytes in vitro and in vivo via modulation of p27(Kip1).Cell Cycle 2008; 7: 257-266. Peng H, Du B, Jiang H, Gao J. Over-expression of CHAF1A promotes cell proliferation and apoptosis resistance in glioblastoma cells via AKT/FOXO3a/Bim pathway. Biochem Biophys Res Commun 2016; 469: 1111-1116. Dey P, Strom A, Gustafsson JA. Estrogen receptor beta upregulates FOXO3a and causes induction of apoptosis through PUMA in prostate cancer. Oncogene 2014; 33: 4213-4225. Cornforth AN, Davis JS, Khanifar E, Nastiuk KL, Krolewski JJ. FOXO3a mediates the androgen-dependent regulation of FLIP and contributes to TRAIL-induced apoptosis of LNCaP cells. Oncogene 2008; 27: 4422-4433. Han DF, Zhang JX, Wei WJ, Tao T, Hu Q, Wang XF. Fenofibrate induces G0/G1 phase arrest by modulating the PPARalpha/FoxO1/p27 kip pathway in human glioblastoma cells. Tumour Biol 2015; 36: 3823-3829. Liu MH, Lin XL, Li J, He J, Tan TP, Wu SJ. Resveratrol induces apoptosis through modulation of the Akt/FoxO3a/Bim pathway in HepG2 cells. Mol Med Rep 2016; 13: 1689-1694. Liu MH, Li GH, Peng LJ, Qu SL, Zhang Y, Peng J. PI3K/Akt/FoxO3a signaling mediates cardioprotection of FGF-2 against hydrogen peroxide-induced apoptosis in H9c2 cells. Mol Cell Biochem 2016; 414: 57-66. Bassi C, Mak TW. Regulation of the Phosphatidylinositide 3-Kinase Pathway by the Lipid Phosphatase PTEN. Clin Chem 2016; 62: 884-885. Zhu G, Baker SJ. Detecting PTEN and PI3K Signaling in Brain. Methods Mol Biol 2016; 1388: 53-62. Yang H, Kong W, He L, Zhao JJ, ODonnell JD, Wang J. MicroRNA expression profiling in human ovarian cancer: miR-214 induces cell survival and cisplatin resistance by targeting PTEN. Cancer Res 2008; 68: 425-433. Schondorf T, Gohring UJ, Roth G, Middel I, Becker M, Moser N. Time to progression is dependent on the expression of the tumour suppressor PTEN in ovarian cancer patients. Eur J Clin Invest 2003; 33: 256-260. Chen Y, Zheng H, Yang X, Sun LM, Xin Y. Effects of mutation and expression of PTEN gene mRNA on tumorigenesis and progression of epithelial ovarian cancer. Chin Med Sci J 2004; 19: 25-30. Fei M, Zhao Y, Wang Y, Lu M, Cheng C, Huang X. Low expression of Foxo3a is associated with poor prognosis in ovarian cancer patients. Cancer Invest 2009; 27: 52-59. Lu M, Zhao Y, Xu F, Wang Y, Xiang J, Chen D. The expression and prognosis of FOXO3a and Skp2 in human ovarian cancer. Med Oncol 2012; 29: 3409-3415. Lu M, Xiang J, Xu F, Wang Y, Yin Y, Chen D. The expression and significance of pThr32-FOXO3a in human ovarian cancer. Med Oncol 2012; 29: 1258-1264.